Remember the MMBoard from +++BLUE BLOOD+++ I posted? Also there is an entire freebie section combined with a discount area —- just have a look round the shop. This full set is free for you at Gothica. This is the new Lucky Chair prize at RFyre !! A very nice black suit ! New dollarbies at WEiRD Designs ! A bloody baby doll dress and a skin with tears ! New at WEiRD Designs, this cute Death Ballet outfit for 1L$. 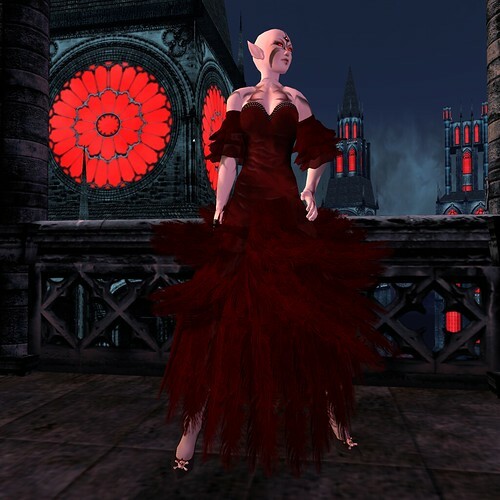 Lokum kindly dropped the latest treasure to be won at Crimson Shadow, The Whisper of the Feather dress in crimson. These dresses tend to be only in the chair for about a month; otherwise, you can snag them form the walls somewhere. You can see a break-down of my outfit here, on my personal blog. You can also look at back posts to see what de fark has kept me busy.